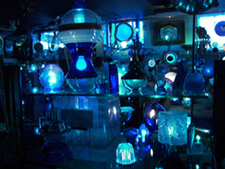 DoNArTNeWs 3/23/08 Alden Cole’s is a luminarist which means he creates unusual light sculptures; not really lamps but fantastical constructs of lamp parts, glass globes and LEDs. Cole has an exhibit of about 20 pieces at Home and Planet at 25 East 3rd Street, Bethlehem, PA. Home and Planet’s motto is “High Style, Earth Friendly” and Cole’s stylized constructs fit right in with the bottle cap tramp art, recycled street signs turned into tables and chairs and South American folk art. Gallery owner Jon M. Clark is currently the cover model for Lehigh Valley Style Magazine, now that is stylin’ to the max. Clark is a Philadelphia native (a member of the Dumpster Divers art collective) and has established his gallery as the hub of the burgeoning art scene revitalizing downtown Bethlehem. 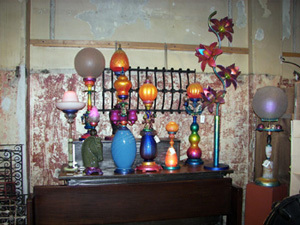 The rear gallery space of Home and Planet is dedicated to outsider artist Jim Bloom. Bloom’s art is hyperactive, bold, scary and inspiring; DoN could tell that Bloom paints to relieve the pain of life as an artist. 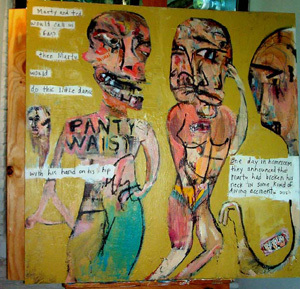 Bloom paints wildly on whatever material is at hand whether it’s canvas, cardboard boxes or even paper plates; each piece tells a bit of his personal history from family trauma, school bullying, personal relationships…it’s all out there, often with words scrawled across the image provoking inappropriate church laughter. Some of the paintings are signed August since Bloom’s Dad thought artists would ruin the family name – DoN totally identifies. Jim Bloom‘s art is featured in the Winter edition of Gaydar Magazine. DoN promised coffee shop art and Darlings Coffee House satisfies the craving with a superlative show by David Katz at Darlings Coffee located at 20th and Pine Streets in Philadelphia. 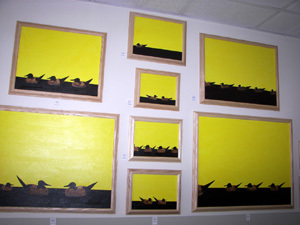 The shop walls are covered in a variety of canvas’ all based on the theme of stylized ducks against a canary yellow sky. Darling’s has a history of promoting area artists and this show demonstrates their willingness to let the artist really express themselves. 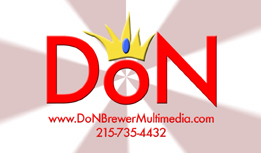 DoN had the first art installation at Darlings when they first staked out 404 South 20th Street several years ago – Darlings also produce Philly’s Best Cheescake and have the awards to prove it. 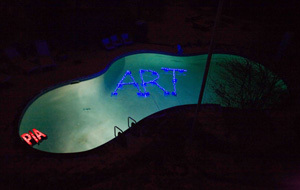 Gallery 339 has a new show of photographs by Amanda Means of light bulbs and glasses of water. This superb space promotes the best in contemporary photography, probably the premier art photo gallery in the region with a wonderful collection of prints. 339 is located at 330 South 21st Street, in DoN‘s neighborhood.Artist, Ben Cohen has a show called Changing the Planet opening April 2 – 27 @ Home Fine Art Gallery, 2 Church St., Mt. Holly, reception Friday April 11, 6 – 8PM.Artist Burnel Yow! 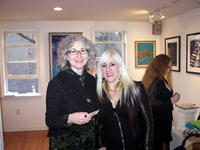 exhibits mandala art at Balance Gallery 112 South 20th Street, Philadelphia through the end of March. This entry was posted in Ceramics & Sculpture, Design, DoNBrewer, Fabric Art, Multimedia Art, Philadelphia, Philadelphia Art, Philadelphia Art Shows, Photography Philadelphia, Pottery, Uncategorized on March 24, 2008 by admin1. March is Women’s History Month, this week’s DoN Art News is dedicated to all my strong women friends who have supported my efforts, inspired me and encouraged me to continue my artistic growth. Since DoN is an honorary girl, the rest of this article is about women’s art happening around town. The current exhibit at The Center for Emerging Visual Artists in the Barclay Building on Rittenhouse Square is currated by friend of DoN, Brooke Hine. Adaptation: Celebrating Growth and Change is an exhibition dedicated to the transformation of environments, organisms, bodies and forgotten places. Brooke has gathered a cohesive collection of new art composed of unusual, unique materials from dryer sheets as an ethereal wall installation to drawings made with human hair to mobile sculpture activated by magnets. Brooke is a well known ceramics artist and has obviously taken great care to gather a collection of exciting new media mixed with traditional composition and craft techniques. The venerable Newman Gallery on Walnut Street has a superb group of art by women on the mezzanine level of this three story historic building. The Newman family has been running the gallery (the first in America) since 1865 and has been open at their present location since 1935! Terry Newman has gathered a group of strong paintings by 20th Century women artist’s demonstrating the influence of Impressionism and modern painting styles. Newman Galleries’ collection of works by American women of the early twentieth century includes numerous nationally recognized artists working in a variety of media and styles. Two of the most prominent women of that era were Elizabeth Washington, renowned for her soft impressions of the unspoiled Pennsylvania landscape, and Fern Coppedge, whose dazzling use of color and composition made her painted scenes come alive. The Cubist still life paintings of Dorcas Doolittle and the dramatic bronzes of Amelie Zell and Beatrice Fenton further illustrate the diversity of talent demonstrated by these women. 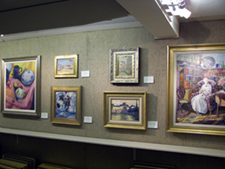 Newman Gallery mezzanine with art by women painters. 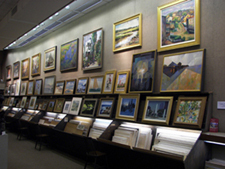 The main floor of Newman’s Gallery is a trove of art, don’t be intimidated to visit and browse through the racks of drawings, prints and paintings; Newman’s staff is super-friendly and the third floor gallery is literally a museum of 18th, 19th and 20th century art. Second Thursday at the Crane Arts Center was totally cool; Jocelyn Firth’s “You Might Find Yourself” show in the Icebox demonstrated that photography is not just “loft art” but inspiring, disturbing and influential. Thomas Prior’s, “Hotel Fire“, brought back the fear of distaster that CNN inflicts on us daily, Ian Baguskas‘, “Search for the American Landscape” elevates the mundane to the sublime with a simple shot of beach sand rendered as a passage of time and John Francis Peter‘s, “Red Tourism“, educates us to how photography and the pursuit of fame is universal if ephemeral. Firth’s curatorial debut in Philly is the beginning of a LoVe affair. 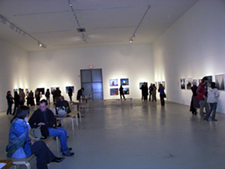 The crowd at Icebox in the Crane Art Center. NEXUS gallery’s 8 artists, 8 viewpoints featuring women artists from Philadelphia art schools, includes a lot of fiber art and unusual fabric constructions coinciding with the FiberPhiladelphia shows going on around town. DoN‘s favorite is Rebecca Landes‘, “I Embroider the Pain Away“; a collection of embroideries of phrases reflecting the angst of modern life and the irony of the old fashioned art of cross stitch intersecting computer age social life – “I’ll Never Look at Your MySpace Page”. InLiquid’s show in the hallway is outstanding: Ruth Borgenicht and Leslie Pontz’s Collaboration: linking metal and clay is fabulous with constructions combining metal mesh and clay globs is fresh and soon to be influential since a group of hanging mesh bags filled with clay will soon be included in a famous, world-class collection. DoN appreciated how the duo utilized the old urinals in the space – so DuChampian. Leslie Pontz & Ruth Borgenicht. 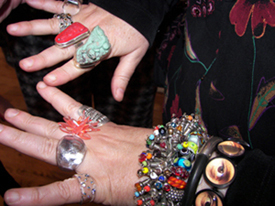 Betsy Alexander shows how to wear art. The “F Word” is all about feminism and other “F’s” from fecundity to fetishism by prominent female artist’s curated by Debra Miller with brave, charasmatic images, constructions and paintings. 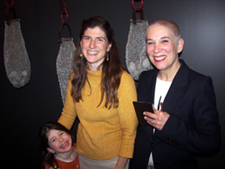 Francine Strauss, Lilliana Didovic and curator Debra Miller at Smile’s “F Word”.Betsy Alexander reports that the Thai food on the first floor is the best in town. Smile is at 105 S. 22nd St., 215-564-2502. 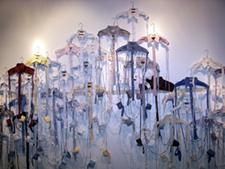 The William Way Gay Community Centerr has a one woman show of fiber constructions by Kathryn Pannepacker in the main lobby. At once political and poetic, Pannepacker’s work combines mundane materials like Q-tips with traditional fibers like jute to produce a collection of flags, sculptures and hangings with messages of hope, tolerance and peace. Speaking of the Gay Community Center – the current issue of Equality, HRC’s magazine features photos from Rachelle Lee Smith‘s wonderful portraits of gay youths who wrote short bio’s on the their pictures from the last art show at the center. Way to go HRC even if you abandoned the T’s in LGBT. Thankfully The William Way Center includes everybody even if it’s a boy who wants to wear dresses or a girl with a moustache and sideburns. The idea that HRC could turn their backs on a sub-group of an already persecuted group in order to push through an agenda is unacceptable; the leadership of HRC should be replaced if they’re not able to understand the evil of discrimination against transgendered people. Next: Coffee Shop Art Shows. This entry was posted in Art, Art Blogging, Art Galleries, Art in Philadelphia, DoNArTNeWs, DoNBrewer, Dumpster Divers, Experience Design, Fine Art Philadelphia, Installation, Mixed Media Art, Newman Galleries, Philadelphia, Philadelphia Abstract Art, Philadelphia Art, Philadelphia Art Galleries, Philadelphia Art Installations, Philadelphia Art Shows, Philadelphia Artists, Philadelphia Artists, Philadelphia Sculpture, Photography Philadelphia, Recycled Art, Social Practice, Uncategorized, Upcycled Art and tagged abstract art, Art, Art Installation, Blue Grotto, DoNArTNeWs New News, DoNArTNeWs Philadelphia Art News Blog, mixed media art, Philadelphia, Philadelphia Art, Philadelphia Art Gallery, Philadelphia Art News, Philadelphia Artist, Philadelphia Fine Art, Randy Dalton on March 21, 2008 by admin1. This entry was posted in DoNBrewer, Multimedia Art, Philadelphia, Philadelphia Art, Philadelphia Art Shows, Photography Philadelphia on March 4, 2008 by admin1.